Eczema is name given to a group of skin conditions characterized by inflammation and irritation of skin. Atopic dermatitis is the most common type of eczema. The cause of eczema remains unknown; however, it is caused as a result of an overactive immune system response to an irritant or allergen such as rough or coarse material, extremes of temperature, exposure to household substances such as detergent or soap, animal dander and stress. Eczema is common in individuals who have family history of other allergic disorders such as asthma and allergies. 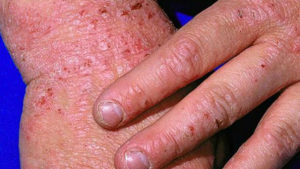 Eczema is not contagious and cannot be spread from one individual to another. Eczema is diagnosed by your primary care physician, pediatrician or a dermatologist. There are no specific tests to diagnose eczema. Your doctor will often diagnose it based on the appearance of the lesions of your skin and other symptoms. You may be asked to perform allergy testing to determine what the possible allergens that trigger your condition are. The treatment of eczema aims at relieving and preventing the itching. Creams and lotions are advised to keep the skin moist and relieve itching. Itching can also be relieved by using cold compresses. To decrease inflammation of the skin, OTC products such as hydrocortisone 1% cream, corticosteroid containing prescription creams may be recommended. In case there is infection of the affected skin, antibiotics are prescribed. In people who do not respond to these treatments, antihistamines to decrease itching, tar treatments, phototherapy and drug cyclosporine may be recommended.